I can speak first-hand about experiences with anxiety, being someone who has an anxiety disorder as long as I can remember and experimenting with different means of dealing with it. I would definitely recommend to anybody experiencing consistent anxiety to try daily exercise first before trying medication. I was on the treadmill today and realizing what an amazing therapy consistent exercise is, especially for stress, anxiety and depression. I think for it to be optimally effective, you’d want to do fairly intensive exercise (at least so you’re breaking a pretty good sweat) 4-5 times per week, consistently. I find it’s the act of really committing yourself to it fully that helps the most. 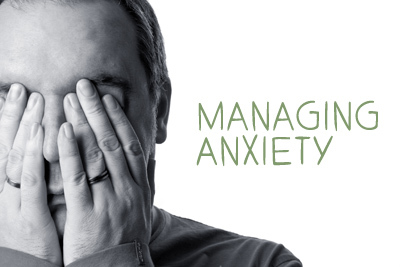 Another really important therapy in dealing with anxiety is cognitive behavioral therapy, which is the consistent practice of analyzing what’s going on in your mind and re-programming the dysfunctional and unhealthy thought patterns into healthy ones. The reason I think this is so important (aside from the obvious) is that it teaches us to pay closer attention to what’s going on in our minds and how our thoughts so easily spiral without us noticing it that stir up unnecessary emotion in us and drain our energy in a matter of seconds. By getting in the habit of paying attention to these things, we can learn to take better control of them and reduce a lot of emotional distress. There are cognitive behavioral therapy workbooks you can just buy online and work through and I think they are really worth the time — even if you don’t have bad anxiety and just want to practice working on being aware of and work on analyzing your thought patterns. After all, everyone has detrimental thought patterns now and then. Taking anti-depressants for anxiety CAN be a life saver and really help you focus on keeping your thoughts positive by taking the edge off of the anxiety (I would know, having been on prozac for 8 years), but the problem is it’s easy to become psychologically dependent on these drugs as your only means of dealing with the anxiety, and who really knows exactly how they are affecting your brain. Anxiety, Mental Health anxiety, exercise, mental health. permalink.